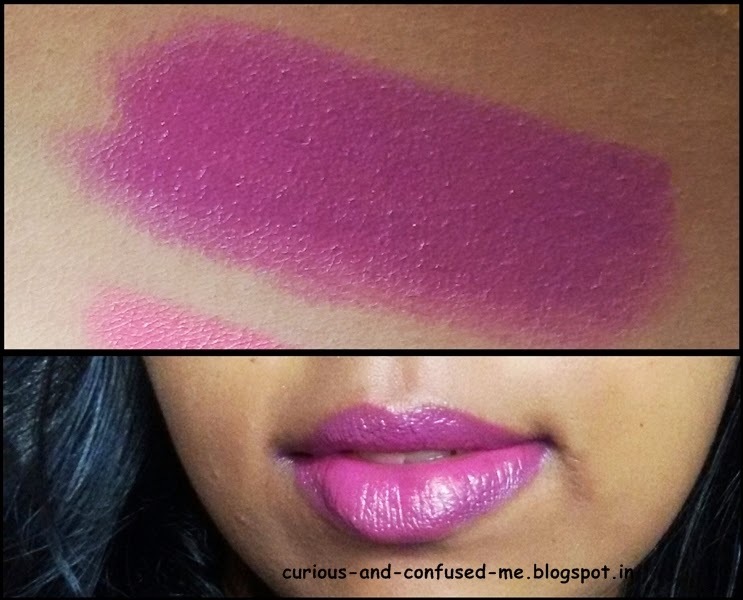 Posted on April 7, 2015 by Swathi Bhat wrote in Affordable, Lakme, Lips, lipstick, Pink lipstick, Purple lipstick, under 300. It has 4 Comments. 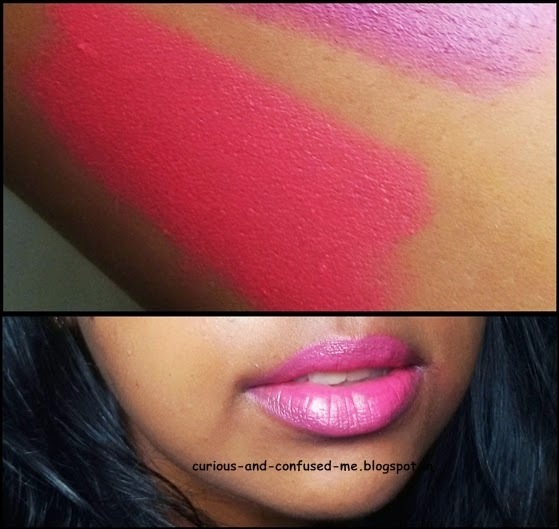 Lakme enrich lipsticks range have some gorgeous shades, I mean the old range. You should see the pinks they offer, so pwetty!!! But along with that they also offer the old maroon packaging, which almost all of us hate. There was one more reason I would not go near them, the old range would not stay even for 1.5 hour on me :/ I kept neglecting this range with heavy heart . Finally Lakme buckled up, changed the packaging, bought some bright colours out ,increased the staying but without changing that creamy dreamy lovely texture. Packaging: Twist up type packaging, the bullet can be seen from the top and shade number is mentioned at the bottom. The cap shuts tightly and is travel friendly. The silver look really stands out. Scent: Candy scent, candy which we used to get in shops about 15 years ago. Sweet syrupy scent exactly like old ones. What I think about P168 ? It’s a typical purple, berry shade which I pick up from every range. This shade has the ability to brighten up the face specially if you belong to medium, dusky and deeper skin tone. It’s creamy, glides on smoothly, one swipe on lips and you are done. If you swipe it more than once ,on the lips the purple shade becomes more prominent and it looks more like a deep purple lipstick yet does not look vampy (Love <3) . Since the shade is darker it stayed on 4+ hours on me. Then leaves a purple berry tint on the lips which goes away with the makeup remover. My fav shade among two . What I think about P165 ? It’s corally bubble gum pink shade, which glides smoothly. Even this covers the lip pigmentation in just swipe. This stayed 3+ hours on me, leaving a light pink tint behind. I felt that this lipstick is little patchy compared to P168. Though lovely shade, I was disappointed with this. One swipe, my face looks pale; two swipes, I look like a clown. According to me this suits lighter skin tones more than the deeper/dusky tones. I have to tweak a little here and there by adding darker lip liner to make it work. Again nothing wrong with the lipstick, just does not suit my skin tone. Affordable, Great shades to choose from, Stays about 4+ hours, Creamy finish, Sturdy packaging. Initially Lakme launched 10 shades and now I believe there are about 40 shades ranging from Pinks to Oranges to reds. Some shades might end up looking little neonish on dusky and deeper skin tones. So check the tester’s before buying them. They both transfer because of creamy texture. New Lakmé Enrich Satin Lipsticks are affordable, creamy with the decent staying power, looks funky and have bright shades. Recommend. One thing I’d prefer to say is that often before obtaining more computer memory, have a look at the machine into which it would be installed. Should the machine is usually running Windows XP, for instance, the memory threshold is 3.25GB. Adding above this would just constitute some sort of waste. Make sure one’s mother board can handle this upgrade volume, as well. Thanks for your blog post. Also I believe that mesothelioma is a rare form of cancer malignancy that is commonly found in those people previously subjected to asbestos. Cancerous cells form while in the mesothelium, which is a protecting lining which covers almost all of the body’s internal organs. These cells typically form from the lining of your lungs, abdominal area, or the sac which actually encircles the heart. Thanks for sharing your ideas. I discovered more interesting things on this weight reduction issue. One particular issue is a good nutrition is tremendously vital while dieting. A massive reduction in bad foods, sugary food items, fried foods, sweet foods, pork, and white-colored flour products can be necessary. Holding wastes parasites, and contaminants may prevent aims for fat-loss. While certain drugs momentarily solve the situation, the terrible side effects will not be worth it, and they also never offer more than a short lived solution. It can be a known indisputable fact that 95% of diet plans fail. Many thanks sharing your notions on this web site. Yay!! Liebster-award :D	The Fake MAC blush brush: Works????!!! !